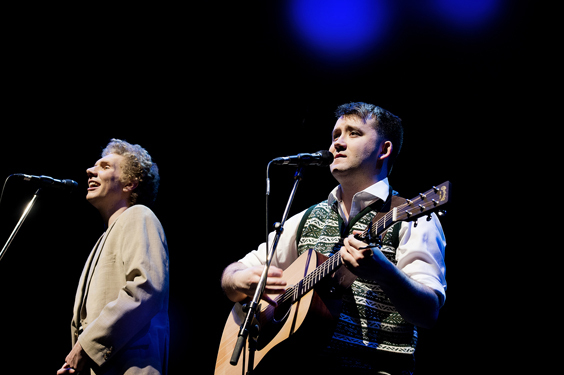 As the all-time leading folk-rock duo, Simon & Garfunkel deserve a tribute of the highest quality, and at Hull New Theatre, that is undoubtedly what the audience were treated to. From the moment ‘Art’ opened with the haunting strains of ‘The Sound of Silence’, and absolutely nailed it, we were in no doubt that this was going to be a treat, with The Simon & Garfunkel Story telling the tale of Paul and Art’s rise to fame through their songs, aided by some useful snippets of information along the way. The show has been touring worldwide since its inception as a West End hit, and with Charles Blyth as Art and Philip Murray Warson as Paul, it is clearly in safe hands. 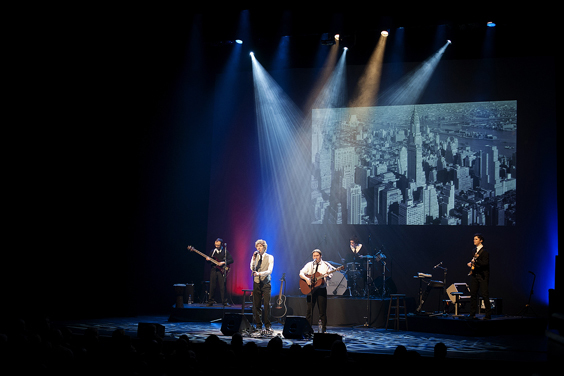 This is also about much more than just the duo, backed up as they are by an excellent three-piece band (Leon Camfield, Adam Smith and Mat Swales), with huge screens showing pictorial and video footage of Simon & Garfunkel, along with key figures and events from the 1960s and 1970s to put the duo’s output into a social history context. Following on from ‘The Sound of Silence’, the story is then told largely in chronological order, from their early years as Tom & Jerry, when they took their inspiration from the Everly Brothers, to their first trappings of fame, their unimaginably huge period of success, and their subsequent acrimonious split, before ending with their 1981 reunion concert in New York’s Central Park. The songs are given their due prominence, though both Paul and Art inform the audience as to the origins of those songs and how the duo were affected by fame and the pressures that come with it. For the lightest of fans, all of the big hits are here, such as ‘I Am a Rock’, ‘The Boxer’, ‘Homeward Bound’, ‘Cecilia’, ‘Scarborough Fair’, ‘America’…the list goes on and on, reminding the audience of what a phenomenal back catalogue of songs the duo recorded. In addition, and importantly in my eyes, there are also several of their lesser-known offerings, making this an enlightening and educational experience for even the most hardened of enthusiasts, and ensuring there is something for everyone in the performance. While it’s perhaps difficult to offer praise of one person rather than another, I have to mention Blyth’s performance as Art Garfunkel, which simply has to be seen to be believed. Garfunkel undoubtedly has one of the most unique and distinctive voices in music history and to get anywhere near replicating this is some achievement, but Blyth is so good that he does the original justice and then some, matching not only his voice, but his on-stage mannerisms to a tee, peaking in an emotional rendition of ‘Bridge Over Troubled Water’ at the end of the show. The Simon & Garfunkel Story returns to Yorkshire in the coming months, with dates in Sheffield, Harrogate, Scarborough (quite fittingly) and York, and I would urge anyone with even a passing interest in the duo’s work to book tickets now.